There’s a moment in the third episode of The Fresh Prince of Bel-Air’s third season (“That’s No Lady, That’s My Cousin”) in which Uncle Phil and Aunt Viv tell the kids to gather ’round for a special announcement. “We’re having a baby!” Phil, beaming, tells them. The Banks kids and their cousin Will burst into hysterical laughter. When it dawns on them this isn’t a joke, Hilary pipes up. I remember watching this as a 13-year-old and finding it hilarious. Today, I found the clip on YouTube, did some Googling and discovered that the actor who played the first Aunt Viv, Janet Hubert, was all of 36 — and pregnant in real life — when that scene was filmed in 1992. Last month, I turned 39. Guys, I am older than Aunt Viv. As someone who, assuming I’m ever able to have the pleasure, will have a “geriatric pregnancy,” I’ve taken an avid interest in how pop culture depicts mothers-to-be who are no longer in their so-called biological prime. Is their pregnancy used as a plot twist that devolves into a punchline? Or is it an opportunity to work in some real talk about fertility, women’s health and the factors that play a role in a female-bodied person’s decision to delay parenthood? The “later in life” pregnancy is a recurring sitcom trope that’s typically — at least in the case of Family Ties, Malcolm in the Middle and Roseanne — trotted out to accommodate an actor’s real-life baby plans. The mom-to-be is happily married to a lovable TV husband with whom she already has a handful of older children. More often than not, the pregnancy is scripted as an unplanned but not entirely unpleasant surprise. The happy couple takes a beat to laugh about their age and moan about the inconvenience of delaying all their empty-nest fun; then they quickly shift focus to the impending arrival of their precious new family member. Said newborn will inevitably vanish and be replaced by a precocious toddler with great hair after about three episodes. As happy and wholesome as all that sounds, these scenarios gloss over much of the actual mature-mom experience. There’s little talk about infertility, the risk of miscarriage or complications that can arise and change the entire course of a pregnancy. In TV land, older moms exist by happy accident, not an agonizing deep-dive into follicle counts and hormone shots and negative pregnancy tests. But today, there are exceptions. 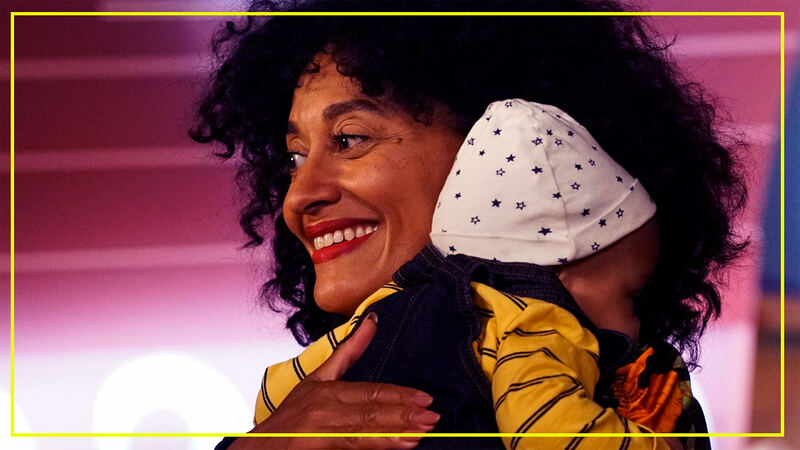 Most notable is how Black-ish — a show that’s progressive and daring on so many issues — handled the pregnancy of TV mom Bow (Tracee Ellis Ross) last season. At first glance, it can seem like Bow’s pregnancy is a return to that familiar trope. She’s a 40-year-old mom with four kids, the oldest of whom is bound for college. And yet Black-ish proved that viewers can handle deeper and more realistic storylines (Bow hiding her pregnancy at work for fear of losing out on a promotion) alongside lighter fare (her being bored at Disneyland because she can’t go on any rides while pregs). The Season 3 series finale in May intensified that balance: One minute, the family is planning a baby shower; the next, Bow’s being diagnosed with preeclampsia, a very serious complication — that, yes, poses a higher risk to moms over 40. The baby is delivered by emergency C-section two months early, and Bow’s life momentarily hangs in the balance. Happily, she and the baby recover, but it’s important that the show’s writers dared not to shy away from legitimate concerns like preeclampsia, maternal mortality and postpartum depression, the latter of which Bow has struggled with this season. The British comedy Catastrophe has also portrayed pregnancy in a rare, refreshingly realistic light. Irish schoolteacher Sharon (played by Sharon Horgan, who writes the series with costar Rob Delaney) also has an “oops” pregnancy. The catch is that she — unlike possibly every other “older mom” on TV — is single, and the father is an American man (Delaney) with whom she’s merely had a brief fling. They do fall into screen-cliché territory by deciding to couple up and raise the baby together à la Knocked Up, but the budding rom-com remains grounded in reality as far as the actual pregnancy is concerned. As a woman who is closing in on 40, Sharon is repeatedly reminded of the health risks linked to her pregnancy. One episode sees her being told that her baby may have Down syndrome, a situation the show handles with honesty and heart. She eventually gets the all clear, but later goes into early labor and delivers her son prematurely. Some viewers may accuse these shows of fearmongering or of perpetuating stereotypes that women shouldn’t be putting motherhood on hold. That’s an unfair assessment. Every woman’s fertility journey is different; a woman in her mid-40s may have an effortless experience, while someone 15 years younger struggles. But to never acknowledge the concerns that real women discuss — to only tell some stories — is to do society (and pregnancy and women for that matter) an injustice. Now, can we get more TV shows about IVF already?